My basic requirement was for a practical 5-door hatchback that wasn't FWD. The Audi A3 and Nissan Juke didn't have enough headroom so that left the new Impreza as my only option. I enjoy driving it and it does what need but I wish Subaru offered more and better options. What I really wanted was a BMW 1-series but for some reason they don't sell the hatchback model in the USA. 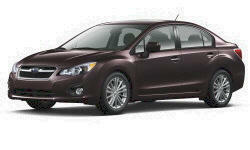 Why the 2012 Subaru Impreza / WRX? Handling is excellent. The firm suspension and low center of gravity deliver minimal body roll in turns. The full time AWD and good weight distribution help to keep everything neutral with no torque steer and minimal understeer or oversteer. Stability control is effective at keeping you out of trouble. I am 6'4" tall and this is one of the few compact cars I fit into easily with room to spare. There's plenty of space in the cargo area for all of my sports equipment, especially with the rear seats folded down. Packaging is very efficient; they have it as much interior space as possible while keeping the vehicle small. The rear seats actually have enough space to comfortably fit full size adults or child car seats. The doors open wide making ingress and egress easy. At about $26K out the door including all taxes and registration this car is dirt cheap for what you get. I can beat it up and toss it around without worrying that I'm ruining a nice car. Why Not the 2012 Subaru Impreza / WRX? Subaru had to save money somewhere to keep the price down so they cut a lot of corners on the interior. Headliner is tacky "mouse fur" fabric. Visors are covered with flimsy vinyl and the vanity mirrors have no lights. Window and lock switches on the driver's door don't light up unless the ignition is on. Rear seats have no vents. Cargo area needs an overhead light and another pair of tie-down points. Lack of window tinting makes the interior heat up in the summer. The stereo system sounds terrible with lots of distortion and no bass. They offer a subwoofer as an official accessory but it takes up a lot of space in the cargo area. Seats only adjust two ways, and manual adjustments at that. They're adequate for short trips but uncomfortable if you have to sit for hours. I wish there was an option for multiple power adjustments with memory. Engine is simply weak. The CVT works well but can only do so much to mask the engine's lack of power. For some reason they don't offer HID headlights even as an option. When I bought mine they didn't offer a backup camera either. Now they do, but you have to take the expensive navigation system to get it. I don't know why anyone would want to buy a navigation system from a car manufacturer now that we all have smartphone apps that work so much better. While I have some complaints, overall it's a good little car and an excellent value. If it got stolen or something I would probably buy the same kind again.